First of all, my hair is getting redder as I get older. I kinda like it. Still, I need a haircut because it's doing the most awful things in the back. I mean, you thought I was complaining before, you should hear me NOW. And no amount of backcombing or hairspray can tame the wild beast that is FLAT LIKE A BOARD in the back. It also is NOTICEABLY LONGER. Not that there's anything wrong with that. I personally love long in the back, shorter in the front hairstyles and vice versa... when it's done on purpose and done RIGHT. Anyways, I was looking for cuts and styles and color because, well, I haven't colored it yet either because I'm LAZY. What was I saying? Oh yeah. Cute, right? 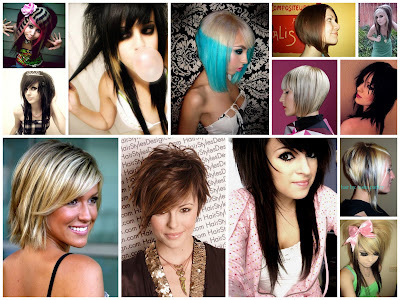 Even if it's not YOUR style, you have to appreciate the technical aspects of Emo hair. For reals.